Celebrate spring with a long Easter weekend in the UK. There are loads of things to do all over the country. It's the first bank holiday weekend of the warmer seasons in the UK and a special treat, after the bleak midwinter months of January and February (and usually March) unbroken by a single cheery long weekend or official day off. The Easter Bank Holiday is four days long, including both Good Friday and Easter Monday in England, Wales and Northern Ireland. In Scotland, which follows its own holiday calendar Easter Monday is not a legal holiday. 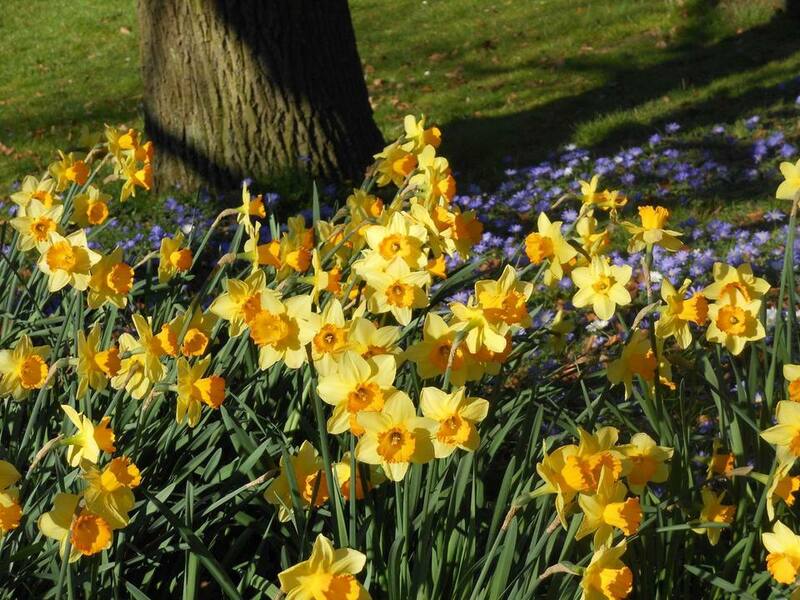 That time of year, UK woodlands will most likely be carpeted with daffodils and camelias. Magnolias, rhododendrons and azalea will be starting to bloom in city parks and country gardens. Meadows and river banks will be sprouting crocus and iris and the feeling of annual rebirth will be strong. And, unlike earlier, perhaps more religious times, almost everything is open throughout the weekend. With 150 artisan food and drink exhibitors, live entertainment, demonstrations by celebrity chefs and a free cooking academy for kids, this festival is the biggest event of its kind taking place anywhere in the UK for Easter 2019. There's Camperfest camping at Chester Racecourse, almost in the city center, a Canine Capers dog show and free cooking classes for kids. The festival runs from Easter Saturday through Easter Monday. The tiny Somerset Village connected with Little Jack Horner (who may have been steward for the last abbot of Glastonbury) welcomes the spring with a traditional village fete on Easter Monday. There are stalls on the high street, food, crafts, games and a display of classic cars. This is an old-fashioned, small town event with Easter bonnet competitions and parachuting Teddies. Some years, there are even daffodils. 2019 is the 40th anniversary of the festival so there will be some extra special events to celebrate. Find out more about the historic village of Mells. Many of England's best gardens open for the season on Easter weekend and quite a few have special displays and events scheduled. At the famous Sissinghurst Castle Gardens, pictured here, there's the added bonus of chocolate Easter eggs hidden around the gardens. In spring 2019, Longleat's newest animals will make their debut as England's oldest and best safari park welcomes a pair of Koalas to their new home, Koala Creek. And then of course there are all sorts of other real beasties, including Longleat's wonderful monkeys, lions, tigers and more all happy to be outdoors for the season again. The first young lambs, bouncing across a field after their mothers, are a sure sign that spring has arrived. The National Trust has several places where you can visit young flocks and, in some cases, witness lambing. There are rare and unusual breeds at the Home Farm of the Wimpole Estate in Cambridgeshire, thousands of newborn lambs at Ickworth and rare Jacob Sheep lambing at Charlecote Park near Stratford-upon-Avon. At Broomhouse Farm on the Wallington Estate in Northumberland, you can even join in, becoming a lambing apprentice from Good Friday onward for about two weeks. Once again the International Jousting Festival takes over the Royal Armouries in the center of the Yorkshire city of Leeds for Easter weekend. The Royal Armouries has its own tilting yard, armorers and a stable for heavy war horses. It's quite a sight as mounted armored nights engage in Medieval battles and war games. There are several shows a day but they sell out fast so visit the website soon if you're keen to go. In 2019, four teams — from the UK, USA, Canada and Poland, will battle for honor and trophies. Enjoy one of Lancelot "Capability" Brown's finest landscapes with tons of Easter events at Blenheim Palace. The 18th century landscape architect, who practically single-handedly invented the landscape of an English country estate, planted forests, created naturalistic waterfalls and serpentine rivers at Blenheim Palace. Spring is the best time to visit and Blenheim always goes all out for Easter Weekend, all four days. In 2019 they are planning loads of family events in the Pleasure Gardens — circus skills workshops, bouncy castles, archery in the Maze area, storytelling, face painting, and Easter Bunny walkabout, Punch & Judy Shows, and Easter themed puppet show, balloon twisters and a Victorian Fun Fair. Hard to believe, but Britain has some of the darkest places on earth. March and April are considered the best for brilliant stargazing. Pick a moonless night and arrive about an hour and a half after sundown for the best viewing. Check this list of official International Dark Skies Association recognized places in the UK to find the darkest skies near you. Even as a young girl, Beatrix Potter was already demonstrating great artistic and design talent. The Victoria and Albert Museum in London's free exhibition — Beatrix Potter's Art: 'drawn with design' — presents the childhood sketches and other childhood projects of Potter. She went on to create Peter Rabbit, and dozens of beloved animal characters. The exhibition includes her later illustrations, alongside her youthful creations. The show is bound to be an inspiration to any budding artists in your family. Easter weekend is the occasion for the 14th annual Thanet Easter Beer and Cider Festival. The organizers, the Thanet chapter of the CAMRA, (the Campaign for Real Ale) promise this year will be better than ever, with 200 kinds of beer, cider and perry to taste, souvenir glasses, hot food and a pub quiz with a £100 prize. Friday and Saturday of Easter Weekend at the Margate Winter Gardens. And, if the weather is good, enjoy some fresh air on the beach — in Victorian times, Margate with Britain's flattering imitation of Coney Island. They've been staging knockout Marbles tournaments outside The Greyhound, on Tinsley Green, Crawley, West Sussex since 1932. The event became an "International" when US soldiers joined in 1941. At least 100 people — both men and women — regularly take part in this eccentric pub event, on Good Friday every year. If you'd like to take part but left your favorite aggies, marleys, prits and steelies at home, don't fret — you can buy marbles at the event. Or you can just come along for some beer and to pick up the lingo. By the way, knuckling down is getting in position to shoot marbles and people who play this game as experts are known as mibsters. The 56th Annual Gawthorpe World Coal Carrying Championships is scheduled, as usual, for Easter Monday in the West Yorkshire town of Gawthorpe. How fast can you run a mile carrying a 50 pound sack of coal? Men and women compete and achieve amazing speeds. You don't have to take part to enjoy this mayhem. It starts at 11:30 a.m. Easter Monday at the Royal Oak Pub in Owl Lane, Gawthorpe, with registration from 10 a.m.at the Boot and Shoe Pub on the High Street. Women compete as well as men and, some years, even beat the male competitors. There was a time when horseracing was forbidden over the Easter weekend. Not anymore. Lingfield Park in Surrey hosts the flat racing All Weather Championships Finals on Good Friday in 2019. They run the £100,000 Queen's Cup and the Scottish Spring Cup on Easter Saturday racing at Musselburgh in Scotland, where they also lay on live music, free children's entertainment and a visit from the Easter Bunny. Kempton Park holds its Easter Family Fun Day with flat racing on Easter Saturday and so does Haydock Park, near Liverpool. There are lots more. Check the British Horseracing Authority website to find more racing fixtures over Easter Weekend. Most will be open Easter weekend and some have special family deals. At the Blue Lagoon in Pembrokeshire the "family" ticket covers almost any combination of four people as long as one of them is an adult. So Grandma or Auntie can take three children on a special weekend break. Easter in 2019 falls a bit early for most of the big headline music festivals. But that shouldn't stop you. You can get your groove on at London's GarageFest on Good Friday. Or turn day into night at Leeds big daytime rave, Insomnifest, at Leeds underground clubbing space, Beaver Works, from 2 p.m. to 11 p.m. on Easter Sunday. And, don't forget, there are all kinds of music. The 46th annual St. Endellion Easter Festival is a celebration of music for orchestra and chorus in St Endellion, a village in North Cornwall near St Isaacs. For music lovers, it's a chance to hear, among other things, Handel's Messiah, in an interesting and unusual part of Britain. Lots of High Street stores have sales over Easter weekend. This may be your chance to land a great bargain at one of the UK's famous stores — Harrods, Harvey Nichols, Fortnum and Mason or Liberty. On the other hand, you could be more realistic and load up with bargains at Marks & Spencer or House of Fraser. And don't forget all those factory outlets — they'll be putting on special events for Easter sales too. At the Royal Albert Hall, the Royal Choral Society has been performing Handel's Messiah every Good Friday afternoon since 1876. If you'd prefer Bach's St. Matthews Passion, Birmingham's Ex Cathedra Choir and Baroque Orchestra are performing it at Birmingham Symphony Hall on Good Friday afternoon. From April 16 through 27, Sadlers Wells is hosting the English National Ballet and the students of the English National Ballet School in "My First Ballet: Sleeping Beauty." Aimed at a family audience, the performance features a narrator to help younger audience members follow the story and shortened versions of Tchaikovsky's melodies. There are several musicals and shows that adults can enjoy along with the younger members of the family. Over Easter weekend in 2019 you can go after tickets for "Matilda the Musical" at the Cambridge Theatre in London's West End, "The Lion King" at London's Lyceum, or "School of Rock," at the Gillian Lynn Theatre. As of February 2019, there are still plenty of tickets for all of them. Travel to Stratford-upon-Avon, Shakespeare's hometown to see the Royal Shakespeare Company in their home theater. If you didn't think you'd like Shakespeare, seeing this company perform the bard is a real eye-opener. Over Easter Weekend 2019 the company is performing "As You Like It" and "The Taming of the Shrew," as well as a new South African play by John Kani (T'Chaka in "Black Panther"), Kunene and The King.